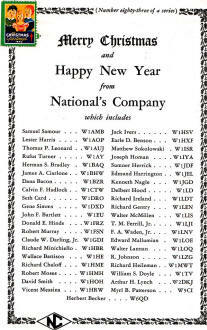 This full-page advertisement by the National's Company (not sure why the apostrophe was included) wished a Merry Christmas and a Happy New Year to QST magazine readers. 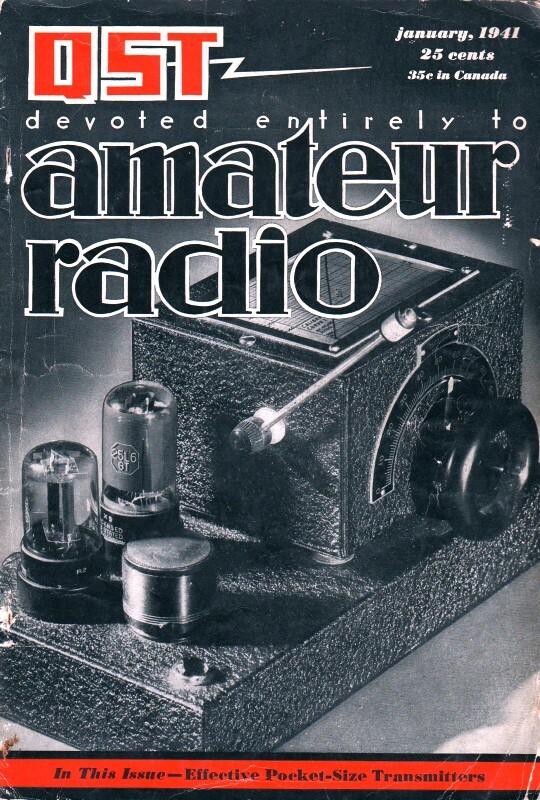 National manufactured a lot of amateur radio equipment at the time, along with some commercial gear for mobile and home radio. 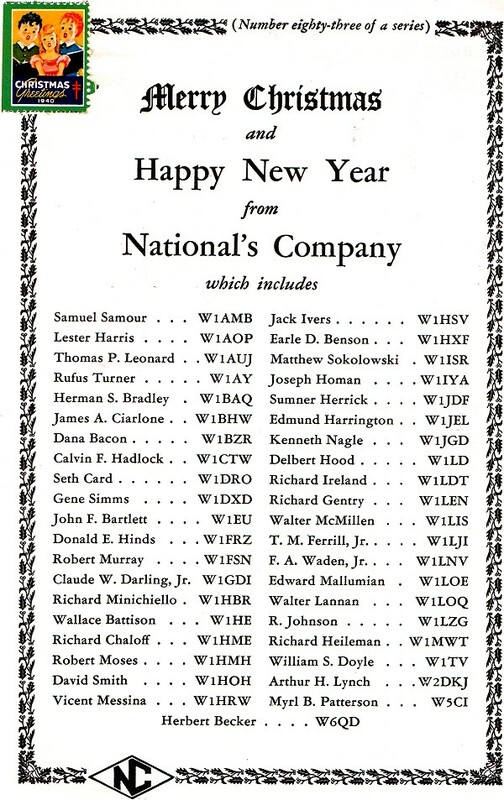 Evidently no fewer than 41 licensed Hams worked at the company since their names are listed. That helps to explain the huge popularity of National's products in the hobby. National Company went to the expense of having a 1940 Christmas Seals stamp affixed in the upper left corner of the page. I was surprised to see the stamp and at first thought maybe the previous magazine owner had put it there, but you can see the outline of a rectangle target for the stamp. Christmas Seals. The American Lung Association was the main purveyor of Christmas Seals in their effort to solicit donations for lung disease research. Apparently, Christmas Seals ended after the 2012 issue. That was at about the time the big push for legalizing pot was going full steam. Suddenly, the anti-smoking ads have all but disappeared from the public service ads. It must just be a coincidence. Samuel Samour W1AMB, Lester Harris W1AOP, Thomas P. Leonard W1AUJ, Rufus Turner W1AY, Herman S. Bradley W1BAQ, James A. Ciarlone W1BHW, Dana Bacon W1BZR, Calvin F. Hadlock W1CTW, Seth Card W1DRO, Gene Simms W2DXD, John F. Bartlett W1EU, Donald E. Hinds W1FRZ, Robert Murray W1FSN, Claude W. Darling, Jr. W1GDI, Richard Minichiello W1HBR, Wallace Battison W1HE, Richard Chaloff W1HME, Robert Moses W1HMH, David Smith W1HOH, Vicent Messina W1HRW, Jack Ivers W1HSV, Earle D. Benson W1HXF, Matthew Sokolowski W1ISR, Joseph Homan W1IYA, Sumner Herrick W1JDF, Edmund Harrington W1JEL, Kenneth Nagle W1JGD, Delbert Hood W1LD, Richard Ireland W1LDT, Richard Gentry W1LEN, Walter McMillen W1LIS, T. M. Ferrill, Jr. W1LJI, F. A. Waden,Jr., Edward Mallumian W1LOE, Walter Lannan W1LOQ, R. Johnson W1LZG, Richard Heileman W1MWT, William S. Doyle W1TV, Arthur H. Lynch W2DKJ, Myrl B. Patterson W5CI, Herbert Becker W6QD.